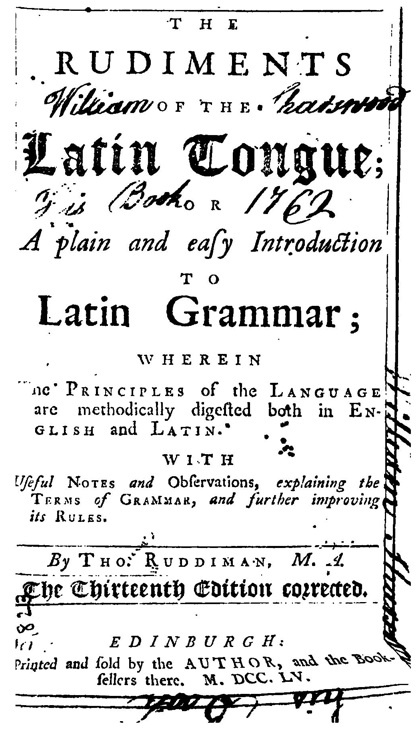 One of Toby's most notable achievements, singled out for praise by Dr Johnson, was his understanding of the Latin language. 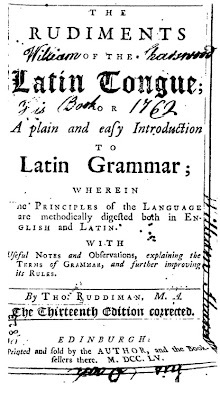 By his own account, he was instructed personally by Dr Adams, Master of Pembroke College at Oxford, using what was, at the time, the standard school text, Ruddiman's Rudiments of the Latin Tongue. The happy alliteration of the phrase, with both man and title dactylic in meter, made for a memorable combination -- so much so that, as late as 1857, a hundred years after the death of Mr. Ruddiman, a book of that title was still being printed. It seems that, rather like the name "Webster's" for American dictionaries, the fame of his name was so persistent that it became a by-word and eponym for any good student Latin grammar. Toby also mentions that Dr Adams presented him with a little book of "Sententiæ Antiquæ." This text is harder to identify; while many there were numerous collections of old Latin saws, none bears this exact title. Popular compilations of the kind were made by Charles Hoole (1610-1667), William Noy (1577-1634), and Giles Jacob (1686-1744), though since these were compendious volumes intended primarily for students of the law, they hardly meet the description "little book." This volume may indeed have been a small, privately printed or even handwritten text, a sort of a primer or sourcebook for the beginning student. Never the less, though the volume may be hard to identify, the Latin phrases from it are all familiar, and seem to have almost immediately found use in Toby's life; he frequently resorted to quoting from them in his Memoirs. Toby was also, at the same time, studying from Cicero's orations against Cataline, and phrases from these were a special favorite. When Toby is kidnapped by a group of rowdy undergraduates, he exclaims "O tempora! o mores!" (O the times, the customs! ), and when he grows exhausted by his contest with a rival Pig of Knowledge, asks "Quo usque tandem" ("How much longer," a famous phrase from the First Oration). Sometimes, Toby rather alters the sense of these sayings; the phrase "Absque Labore, Nihil" -- usually taken to mean that you must work to get anything, is used by Toby to comment on the men he sees working at harsh and tedious employments; to him, it meant that, aside from their labors, these men had, literally, nothing. In some cases, the version of the sayings he quotes are unusual; in the place of Publilius Syrus's usual "Saxum volutum non obducitur mosco" he gives "Musco lapis volutus haud obvolvitur," a version of "Moss grows not on a rolling stone" otherwise attested only in a little-known Spanish volume. Whatever their source, by his use of such phrases, Toby acts and "speaks" much as would any other educated person of his day, and by choosing the apt maxim for the apt moment, demonstrates his learning, with just a very small -- and appropriate -- blush of pride.